In partnership with Bloodrock Records, Debemur Morti Productions will release "Sky Over Giza" the debut EP from mysterious Italian Space Rock band La Morte Viene Dallo Spazio for the first time on vinyl. Debemur Morti Productions will carry 100 limited edition units only — with each piece of vinyl a completely different colour — housed in new specifically-created artwork by SoloMacello (Sleep, Wolves In The Throne Room) and including an additional track not featured on the original CD release. According to the press release, being an open ensemble of musicians gathered from well-known Italian progressive bands, La Morte Viene Dallo Spazio ('death comes from outer space') are a hypnotic free-form combination of acid, psychedelic, space and kraut rock, drone, dark ambient and doom inspired by vintage sci-fi movies and soundtracks. You can stream 3 tracks on Bandcamp. 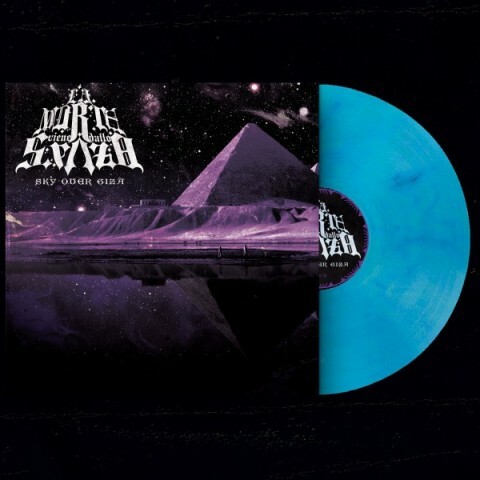 The "Sky Over Giza" vinyl edition will be available on January 11th and can be pre-ordered now.